Yes, we know it’s only June. However, who says football isn’t a year round sport? The NFC East, long known as one of the toughest divisions in the NFL, has actually taken a step back in our minds. The Redskins aren’t as good, and with the loss of Terrell Owens, the Cowboys aren’t as good either. The Eagles are the best team besides the G-Men in the division. We’ll break down team by team, including the Giants, in order of predicted finish. Giants: This may be a Giants blog, but we still believe they are the best team in the East, and possibly the NFC. The Giants have a franchise QB, a tremendous running game, and a stellar defense anchored by that defensive line. Even though Plaxico Burress will be missed, it’s not enough to take the Giants off of their NFC East leading perch. Their running game is too good. Their defense is too good. Are they a Super Bowl caliber team? Yes. They have the talent to get there once again. Will they win? Too early to tell. But the Giants are in for a great year. Buckle up, Giants fans. It’s going to be a fun year. Eagles: The Eagles are the main challenger to the Giants throne. 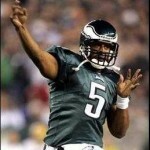 Donovan McNabb seemed to respond greatly to the midseason benching, and they reached the NFC Championship game. They have two young, fast receivers, in Jeremy Maclin and DeSean Jackson. They have the always dangerous Brian Westbrook, Giant Killer, who now has LeSean McCoy to take some of the load off. Their defense is young and fast. The one I thing I worry about is the loss of Brian Dawkins, who signed with the Broncos. He’s the heart and soul of that defense. And while his play might be diminishing, he provide so much. Will they be able to replace that? I’m not sure. Even if they don’t, they have a solid team. I don’t think they will beat out the Giants, but they should be good enough for a playoff spot. Cowboys: Oh, the Cowboys. For all their talent, they seem to self-destruct every year. They have a good–no, I don’t think he’s great yet– quarterback in Tony Romo. (Quick aside: In a Google Image search for Romo, you are hard pressed to find pictures of him on the field. The first ones are of him and Jessica Simpson.) 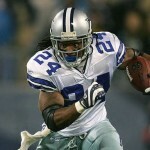 Marion Barber and Felix Jones lead a great running game. DeMarcus Ware is one of the 5 best players in the NFL. Their defense is solid. However, I can’t trust this team, until I see that they can win under pressure. They choked in the playoffs against Seattle, and then went to Cabo and couldn’t beat the Giants. They choked last year , before missing the playoffs. I do think the loss of Terrell Owens will hurt more on the field that pundits are alluding to. Roy Williams has done nothing yet to prove his status as a number one receiver. Until he does, this team might fold under the pressure again. They are such an odd team. So much talent. Maybe the most talent in the NFC East. However, they just don’t know how to win. Until they learn, they’re on the outside looking in. Redskins: Never a lack of drama in the Nation’s Capital. They tried, unsuccessfully, to trade for Jay Cutler, as well as Mark Sanchez. Think Jason Campbell’s confidence is shot? Yeah, me too. Clinton Portis is a great running back, but he’s hurt too much. Santana Moss is a good receiver, but too inconsistent. Chris Cooley is a great tight end. 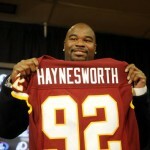 Albert Haynesworth is a tremendous space eater, and should provide pass rushing lanes for rookie Brian Orakpo. However, what makes this team worst in the NFC East is their QB situation. I think Campbell has talent, and I think he has a future in the NFL. Just not with a team that continues to devalue him. The NFC East is still good, but not the best division in the league. The Giants are the best team. The Eagles are a close second. The Cowboys and Redskins are as dysfunctional as ever. Still, when these teams meet, there will be tremendous battles.It should be fun to watch NFC East football. Which division do you think is better? The AFC South?